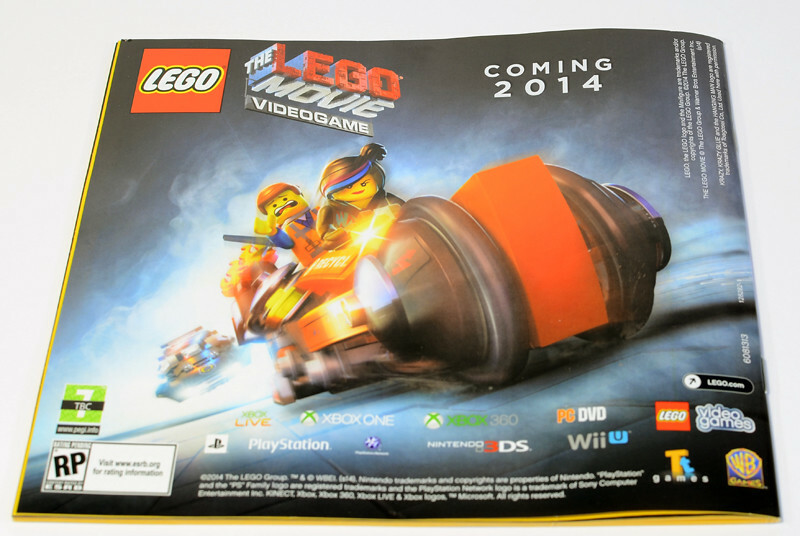 Special thanks to LEGO for sending me all of the January LEGO Movie sets to review. That's right, there will be reviews of all 13! This is just the first. I just figured I'd start with the big precious. Both this and Rescue Reinforcements have nice big boxy boxes of this size. Not that huge since LEGO went all environmental and/or economical with their box sizes, but a hefty enough size. We instantly see all the fun in this set - pretend-gluing of figures, a huge evil suit, ever-laughing Biznis Kitty. Goodies. 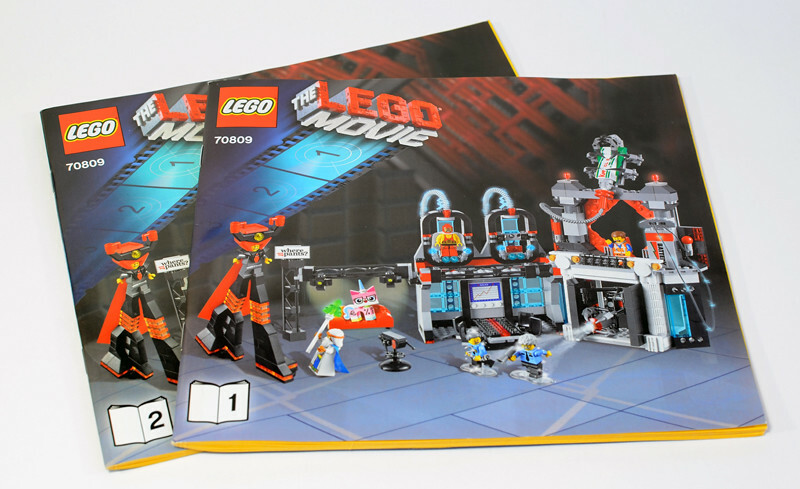 The back shows basically the same thing but with Vitruvius running away, plus some inserts of the play features. My favorite play feature is… replacing hats with hair. Hours of funnnnnnnnnn! 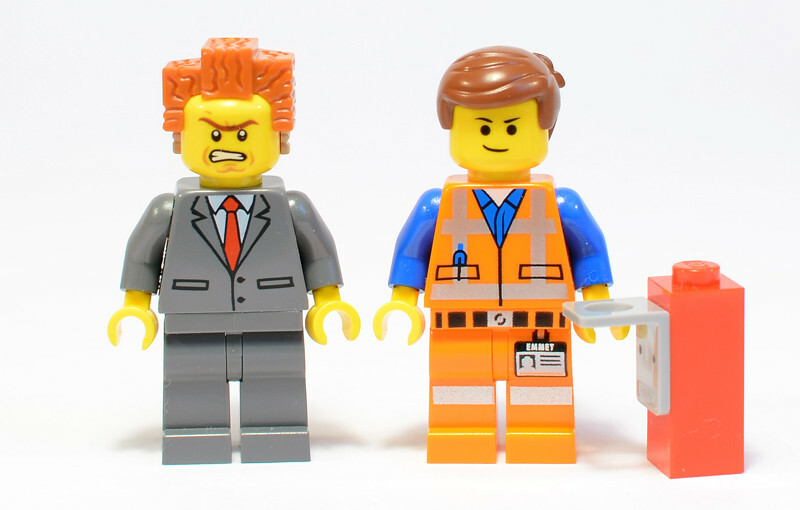 Meet our cast of characters for this set: another boring (but pleasant) Emmet, Vitruvius , Pa and Ma Cop, El Macho Wrestler (who I'm fairly certain was the villain in Despicable Me 2), Biznis Kitty, and Will Ferrell aka President Business. 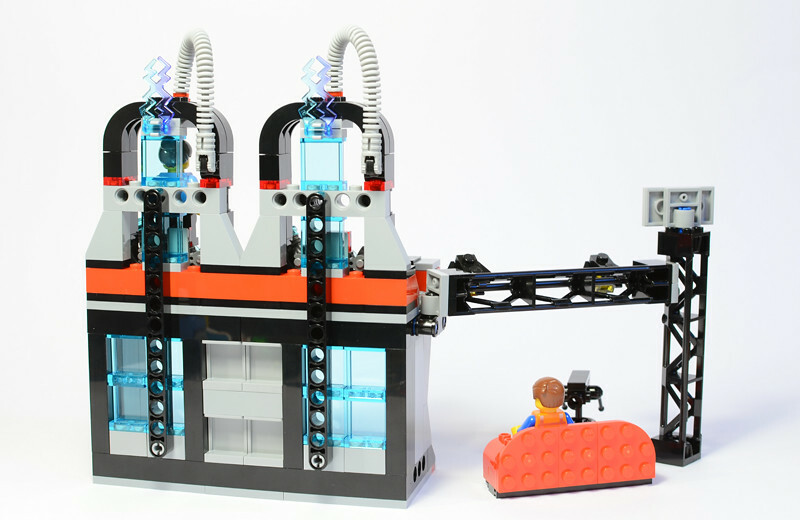 I wouldn't say the minifigures alone make the set worth it, but… this is the way to do a big set. Five cool and exclusive figures are awesome. 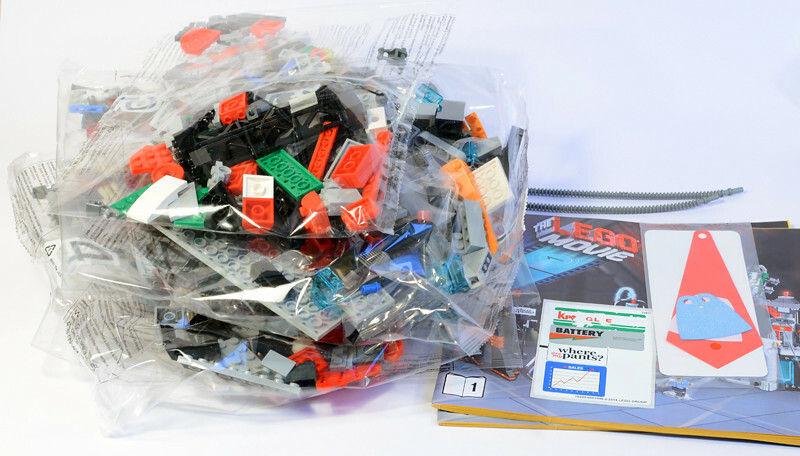 Spill out the box and you get two instruction booklets, a lovely wonderful sticker sheet, the capes packed in a bag with a cardboard card to keep them nice and straight, two metallic-colored tubes, and five numbered bags. Lots of grey and black in there, but enough other colors to break it up. CloneyO doesn't love grey, but I'll deal with it here. Two sizable booklets get us through. 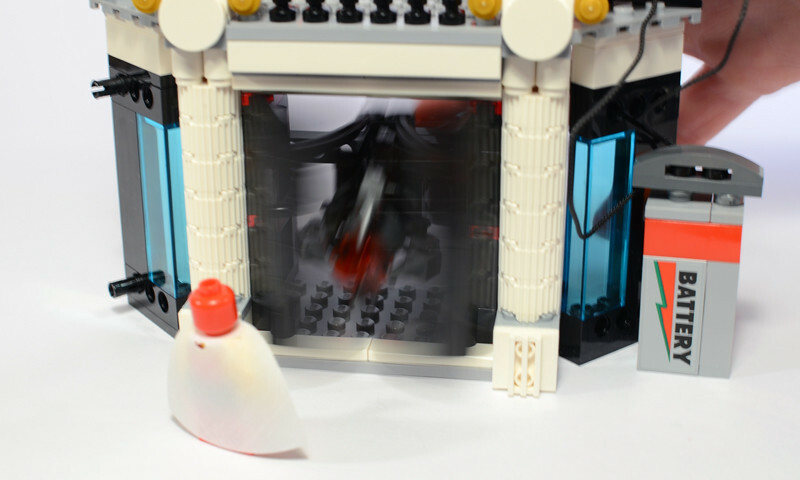 The art makes it look like the LEGO lair is inside a much bigger lair. 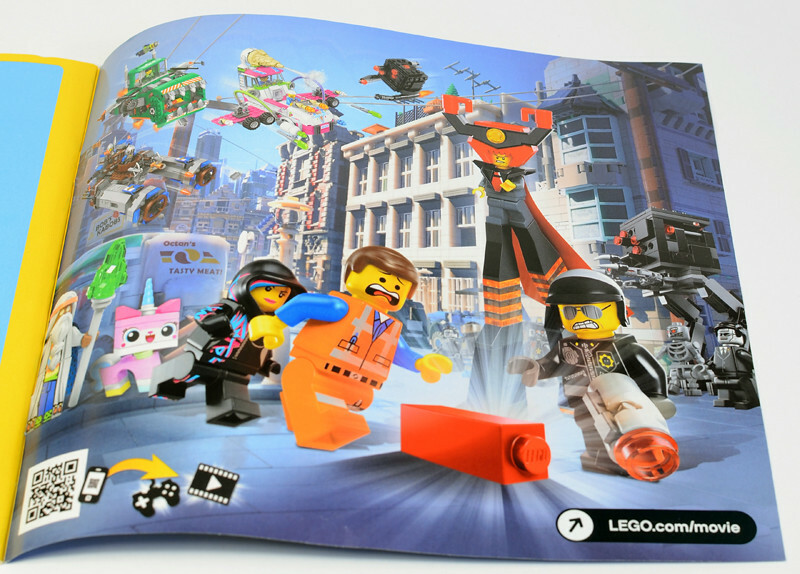 All of the LEGO Movie sets use just a plain blue and orange color scheme for the instructions pages. It reminded me of Creator sets. 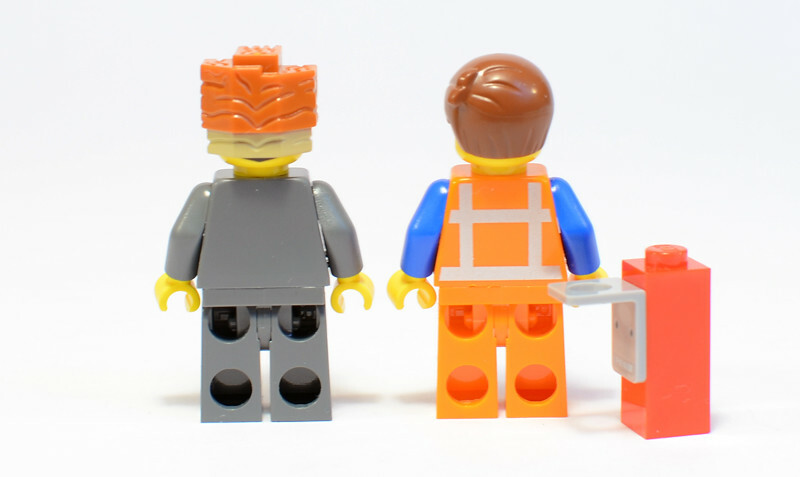 I understand why instructions would look boring for boring Creator sets that are just pieces and no minifigures besides for boring minifigures that nobody wants (#rant), but for these sets it's a bummer. 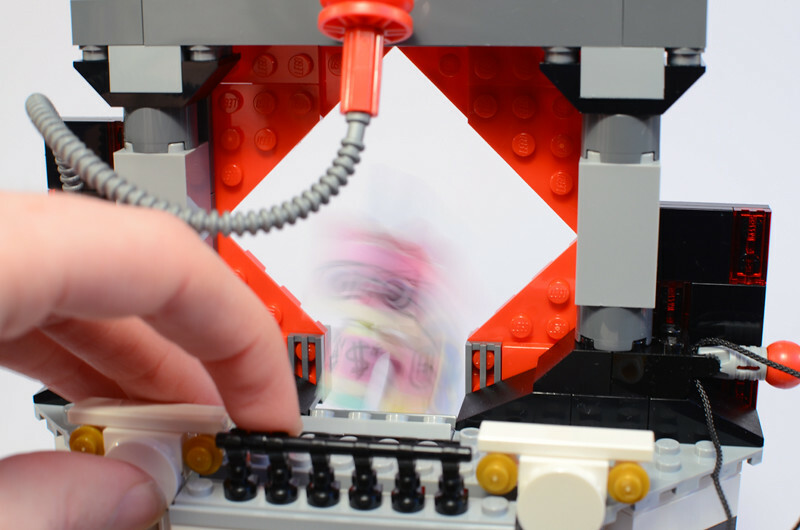 I like those spooky low-opacity pictures in my instructions like the ones in most Licensed instructions! There are a lot of ads for the other sets in here. 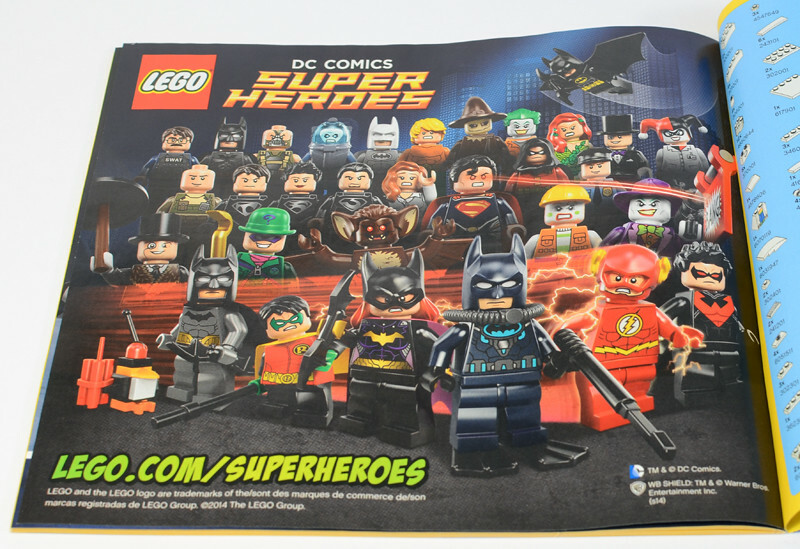 Also, there's the 2014 DC Lineup picture, for some reason. I'll just show that and link the other ads. 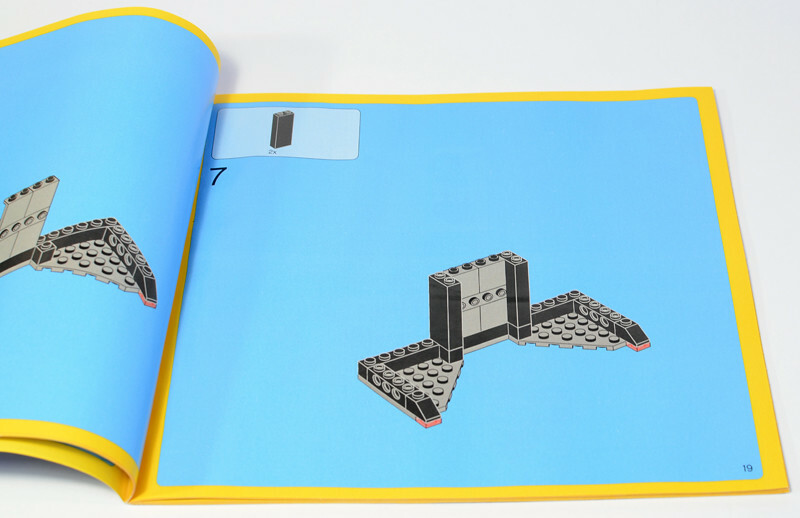 These appear across all the instructions in all the sets. Getting this many cool exclusive figures is just great. 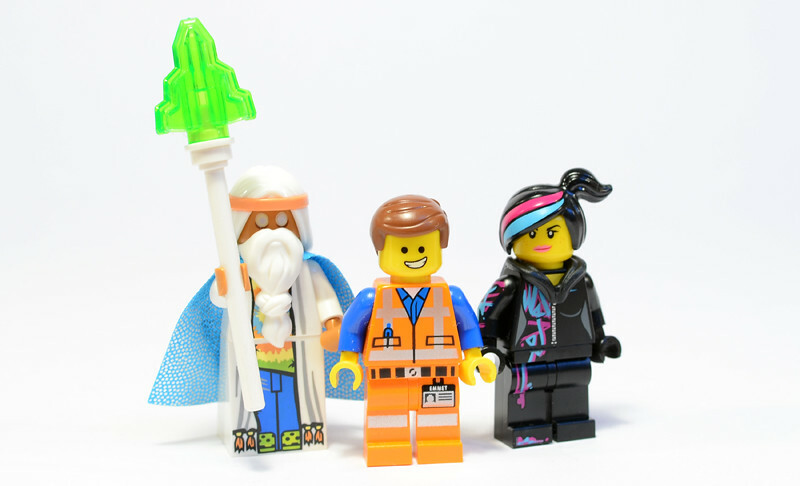 I do think that it would've been nicer of LEGO to include Vitruvius in a cheaper set as well, so that kids who couldn't get this one could still get him. That aside, these are amazing and they deserve some pictures in which they can shine. 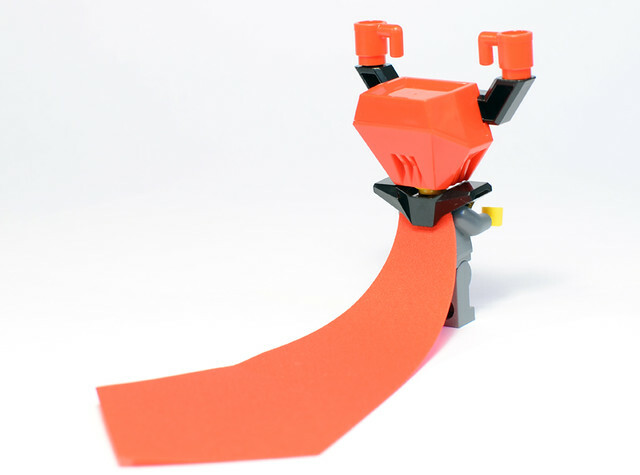 I'll cut right to Vitruvius. His cape is very soft - much softer than regular LEGO capes these days (which are kind of stiff). Perhaps that's so that it doesn't get all bent out of shape by his hair and beard. Speaking of his hair and beard, they're totally fantastic! I love these pieces. Back to his cape, I didn't previously notice that it's got sparkles on one side. It's not a print either - they're like glitter glued onto the cape. There's all Biznis Kitty looking nicely Biznisy from the front. 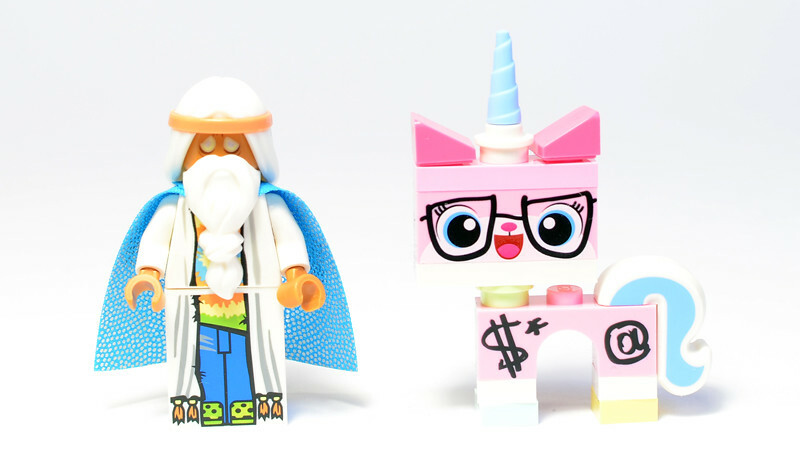 Vitruvius also has a funky, worn-out look. I'm sure Emmet will do that to a person. This side of Kitty has a dollar sign and @ sign. Why? Because who knows. That's why. 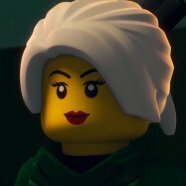 Vitruvius hair is so fantastic. It's a pretty thick hair - either he uses a lot of product or his hair is naturally luscious. It reminds me of Jasmine's hair in Aladdin; perhaps an upcoming Disney Princess set eh eh? Kitty sports the Euro and % signs on her other side. Her neck is very flexible if you couldn't tell. The torso and legs skirt line up well (hooray!) and have a lovely tie-die shirt pattern. 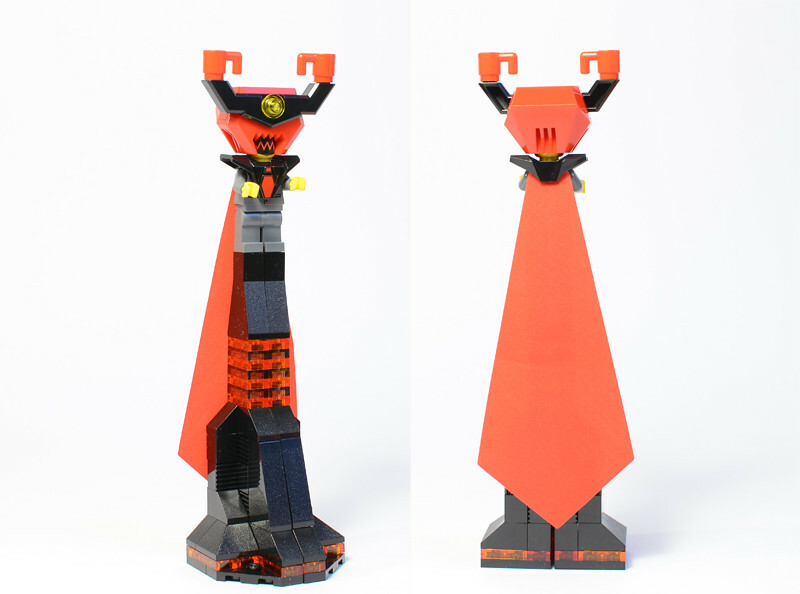 It looks like the skirt is printed to simulate LEGO legs under the robe. Vitruvius is clearly tired out by the abundance of Kitty. Biznis' is exactly the same as regular Kitty but with the scribbles. 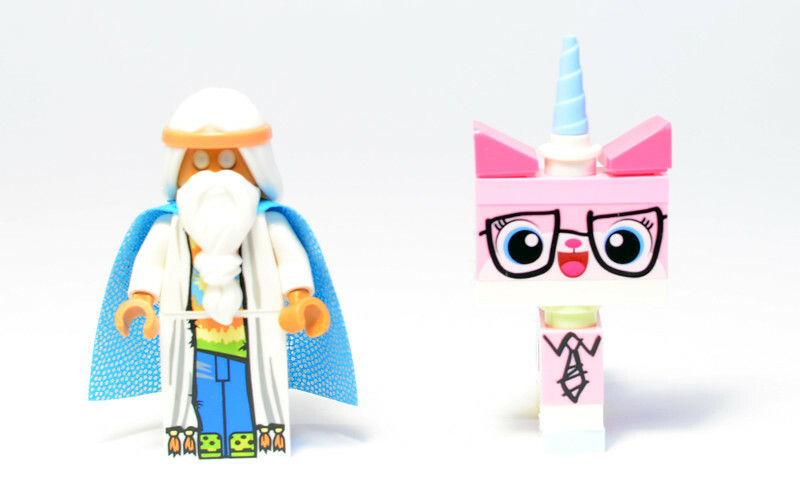 Without the beard, Vitruvius' other face looks like wide-eyed shock. Or drugged-out. 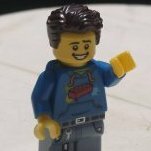 I forsee drug-infused Brickfilms coming. Enough Vitruvius. Next up: the Pres and Emmet. Business has a very simple suit print, fun face, and cool hair. The hair is ridiculous of course, but neat nonetheless. Emmet is Emmet. Not bad. Not revolutionary. Good for parts. Both have reverse heads. President Business' reverse face really goes with the helmet, but it's cool here anyway. 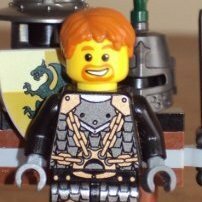 Emmet gets annoying just to look at after a while, and he doesn't even move! 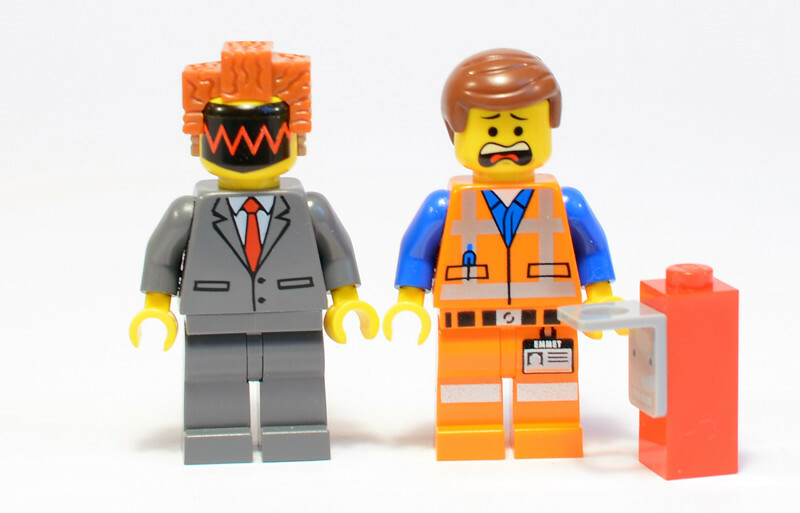 Emmet has his simple back-printing, while Lord Business has none. 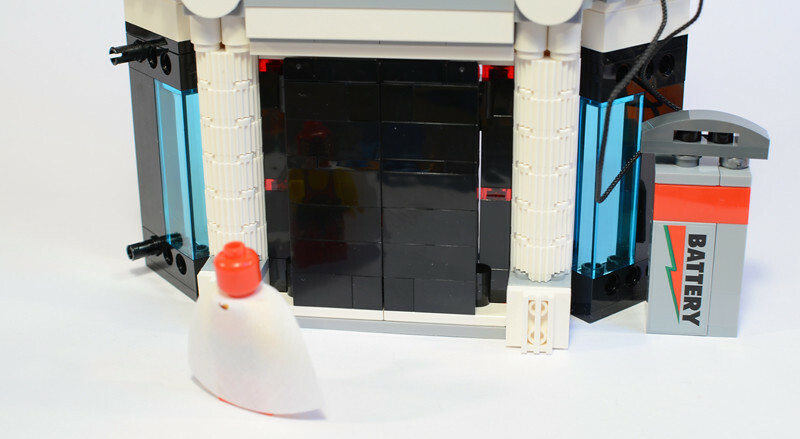 I should've mentioned that Vitruvius doesn't have backprinting either, sadly. Business' back hair looks cool though. Ma and Pa cop are both pretty cool, mostly for their faces and hair. Their torsos, like many in this line, are extremely simple. Like, throw-back '90s and earlier simple. While torsos can get overly detailed these days, the Cops' torsos are so simple as to shock the system a little. El Macho Wrestler looks a bit more detailed, and is a lot of fun. Also cool to see the lilipad *ahem* Army Man stand piece return, this time in clear! Ma and Pa have lovely scared/angry reverse heads. There haven't been too many angry old-people faces yet, not to mention angry old ladies, so these are very welcome. El Macho has some back printing, while the cops don't. 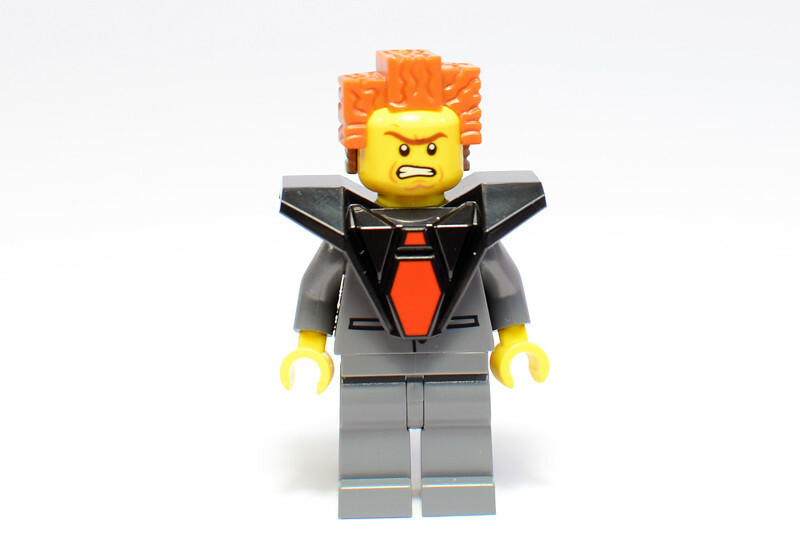 Lord Business can also be outfitted with his super-insane big suit. I assume this guy is manically nuts. His suit certaily is. I love the tie-shaped cape, though. The hat does less for me. It's just too much. I recall people wondering how this thing wouldn't be wildly unstable, and what would keep the minifigure from snapping off all the time. Well, the pants are actually glued to newly-shaped black parts that go in to them. Oh the irony, glued parts in a set where glue is evil. 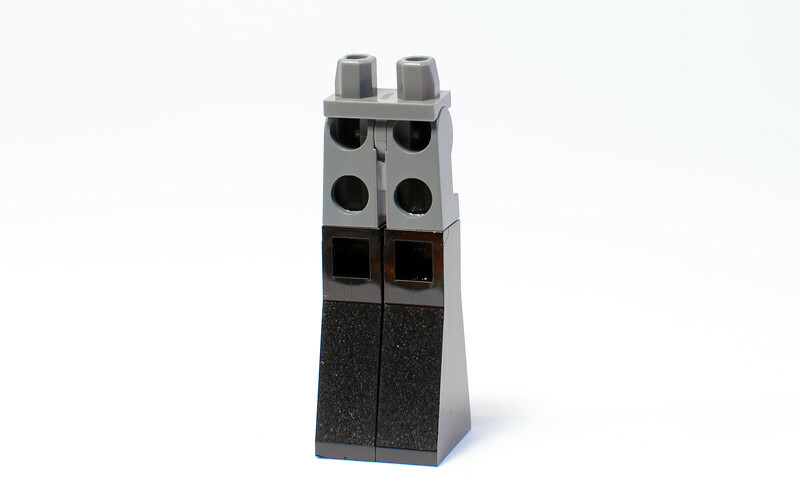 These are interesting, and LEGO nicely gives you the second regular pair so you can make the regular non-suited President as well. I love the neck piece. It looks good without the whole suit too. This build is nice and varied, since you get a bunch of different things and some play features as well as nice details worked in. Overall, it's pretty enjoyable, without too much repetition. Aka my favorite type of build. Here are the extra pieces, which include three white studs with hole in them! Those are always great. Bear with my creative naming. 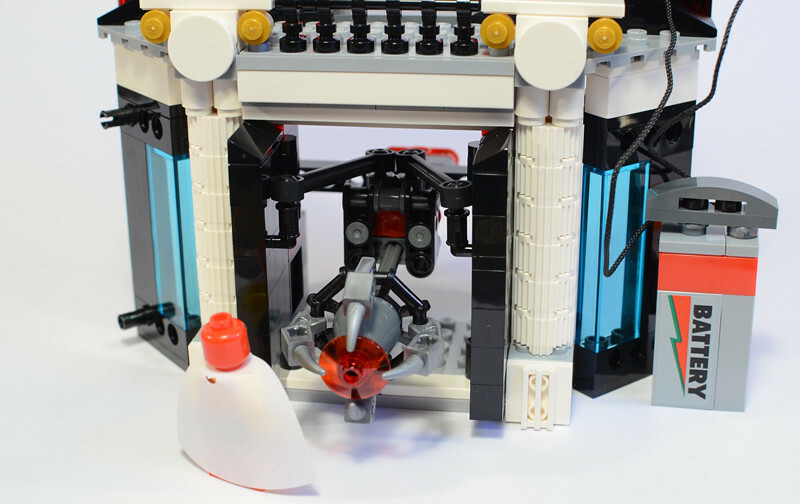 I don't really know what to call the different parts of the lair, which do detach and also snap together, by the by. This side is adorned with lovely columns and a regal balcony. On the bottom are a couple imposing all-black doors, and up top is the big infinity window and Kragle, ready to glue things together! I'm not sure what exacly the battery is for, but it's neat. I always like to get some trans-blue panels as well. Nothing much to see from the back, but there's plenty of play in the front (as we're about to see), so that's no big deal. Here, El Macho goes up to the doors. He doesn't think they look so bad. Just doors. 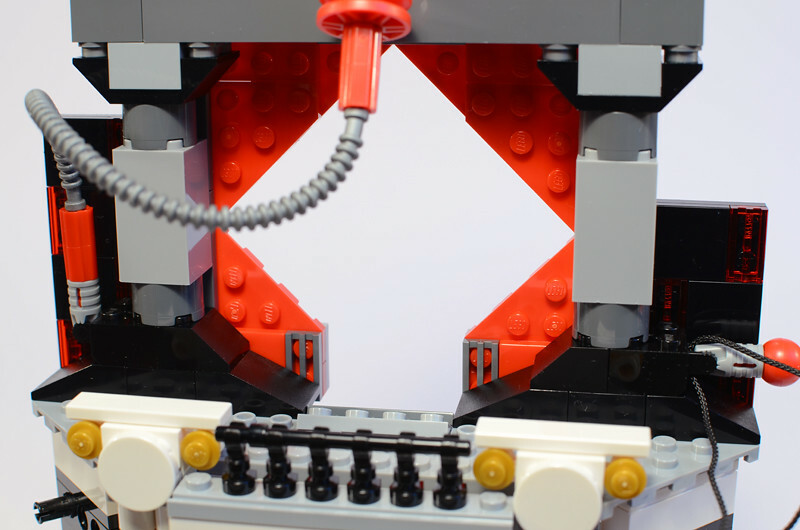 Without warning, the human pushes the gluer from the back, and the doors burst open! El Macho is about to get glued! This play feature is awesome and works well. Just push the thing from the back, and it opens the doors and comes through them. I love it. Biznis Kitty thinks she can chill in front of the infinity window, no problem. Suddenly, the human pulls out the front of the balcony, and her platform tips backwards! She's gone! This play feature is a nice idea, but harder to work. The problem is that you might bump the whole thing and knock whatever you have on the plate into the window without actually pulling the front of the blacony. Still, it's a good thought. I love on the Kragle that the designer has used two stickered parts to simulate a squeezed tube. 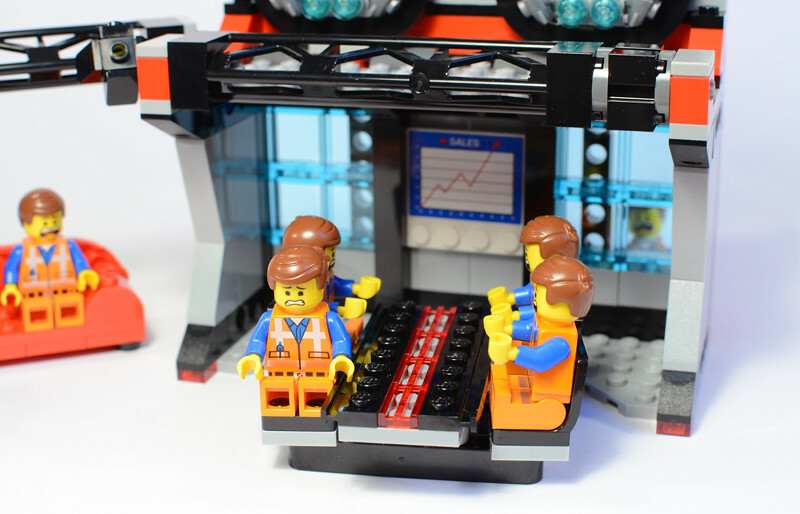 I had not noticed that in the pictures of the set before I built it, and was pleasantly surprised. Great detail. This side has less going on (and no play features), but is still quite nice. The detailing on the torture device things up top is great, as is the meeting table and couch. Let's look at some close-ups. All of my Emmets demonstrate sitting at the table. The problem with the design is that once figures are in the chairs, they can really only be towards the table, looking to one end, or looking away. It's a shame they can't rotate more, but it's still a lovely table. 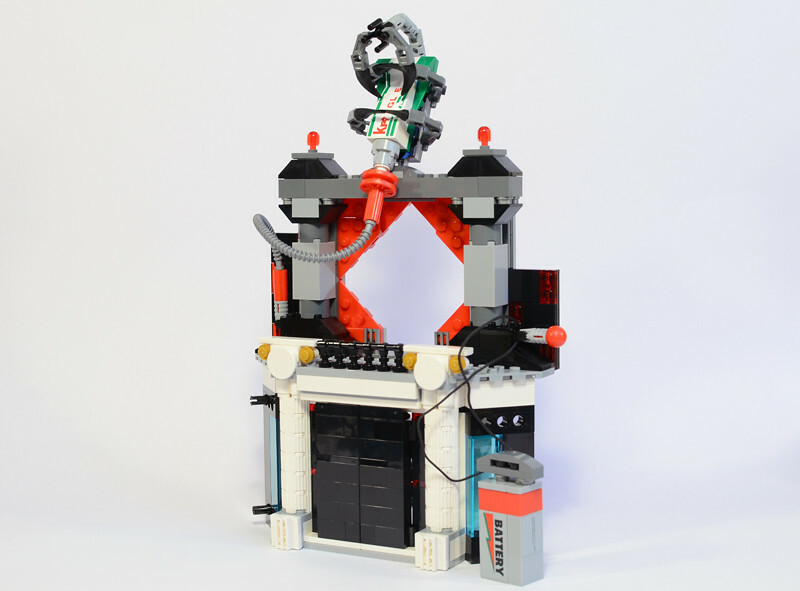 The camera, lights, and especially the couch are all superb little builds. That couch I'll be appropriating that design some time. Some great Studs In All Directions building went into the torture chambers. I love seeing more advanced techniques like this in sets. 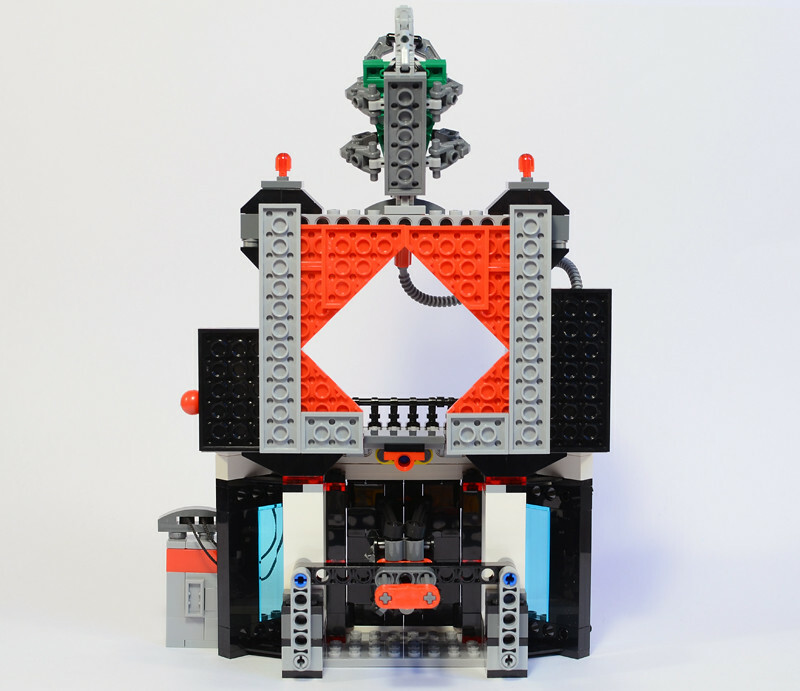 How far LEGO has come. Again, not much from the back. It's all party in the front, nothing in the back. This set is a real stand-out of the wave. 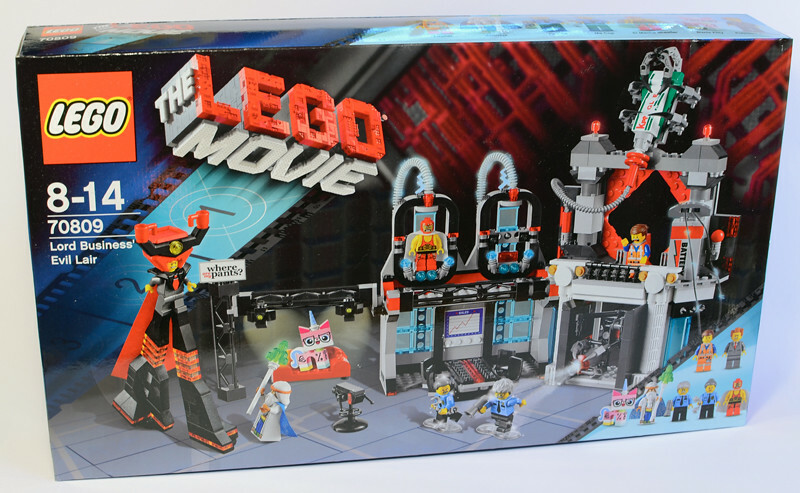 I don't love all the LEGO Movie sets, as you'll see once I review them all, but this one is truly great. 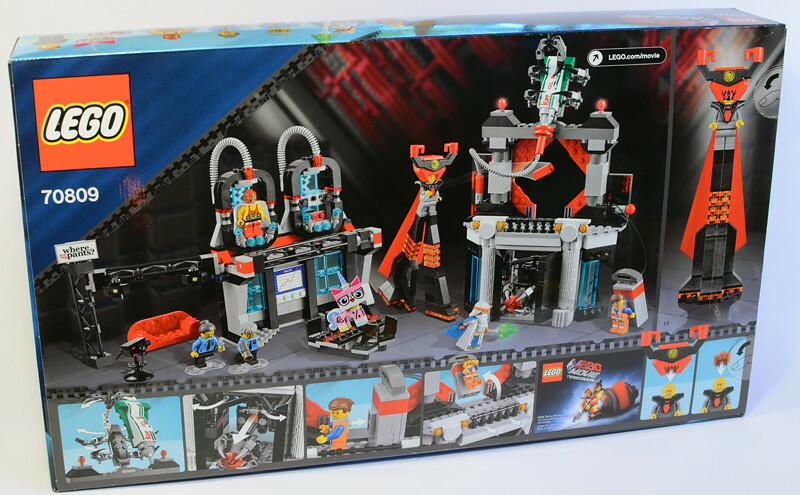 The build is satisfying, the finished model has nice playability and generally looks great, the minifigures are wonderful, and the value is good too. 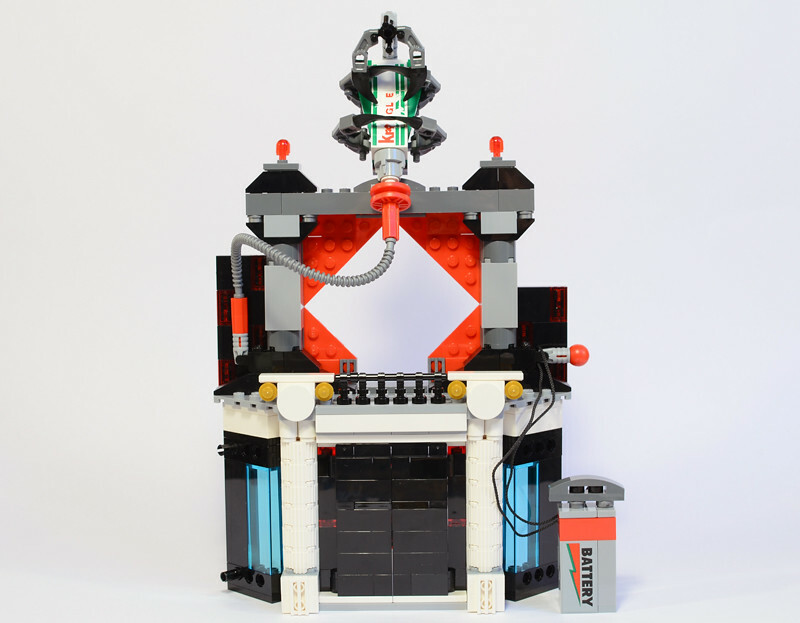 Of course it falls into LEGO's trend of packed-in models as opposed to bigger models with more big pieces, but this one still feels worth $70 overall. 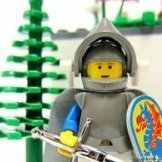 If you like minifigures, good builds, and nice models, get this. It's a lot of fun. Look out for 12 more reviews! Until Next time (which will be quite soon)! 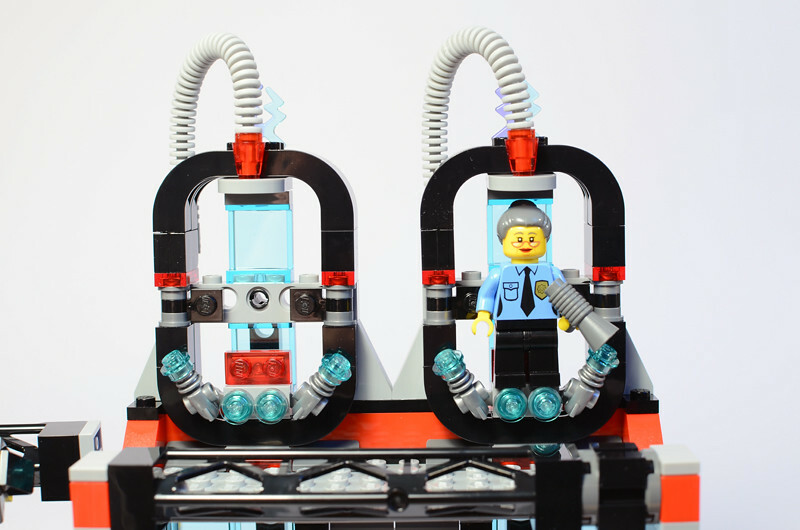 AWESOME review of an AWESOME set 'CoP', I can see the idea that the characters are all minifig size and the glue tube plus battery are human scale/size.....interesting approach as if a child was playing with their minifigs that way.....clever by thinking like a child. The minifigs are cool especial ma and pa officer.....maybe Jay's mom and dad are trying to earn extra cash ? So now Where's My Pants is a TV show eh ? Cool sofa and great board room too ! I look forward to your next review 'CoP' and Brick On Review On ! Great review 'Clone O'Patra'! 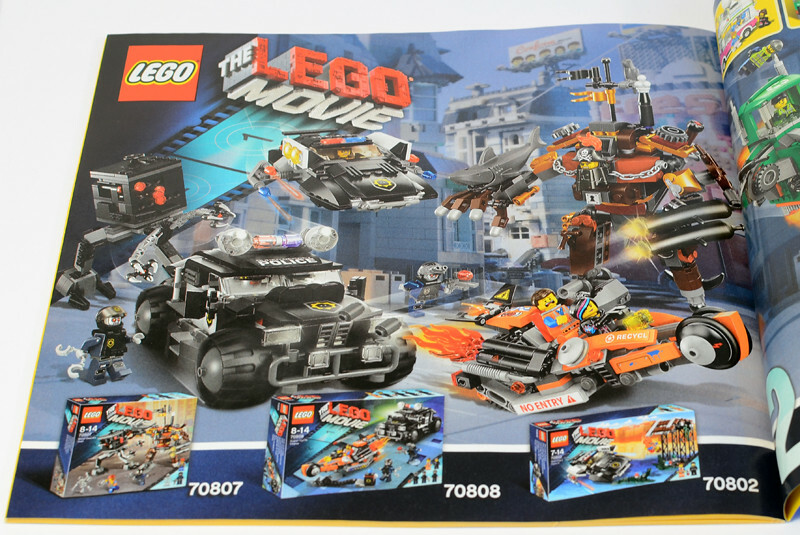 However it seems that I won't be buying much of these sets due it's price tag. 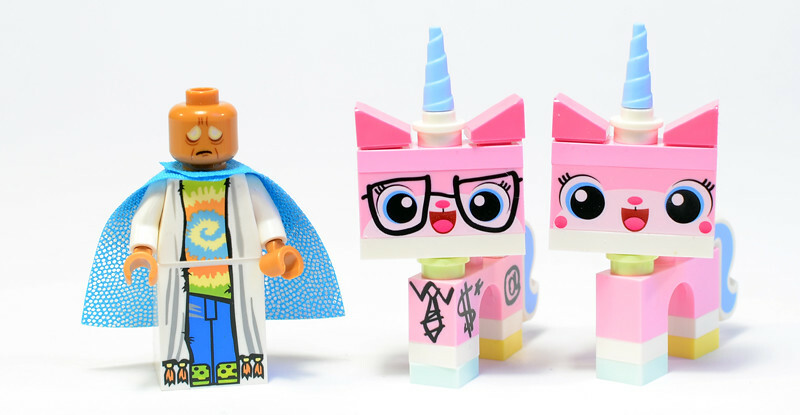 I really want the minifigs! LOL at the Emmett looking in the window at the boardroom! This is the set that grabbed me the most out of the whole wave. It is nice to know that it doesn't disappoint. 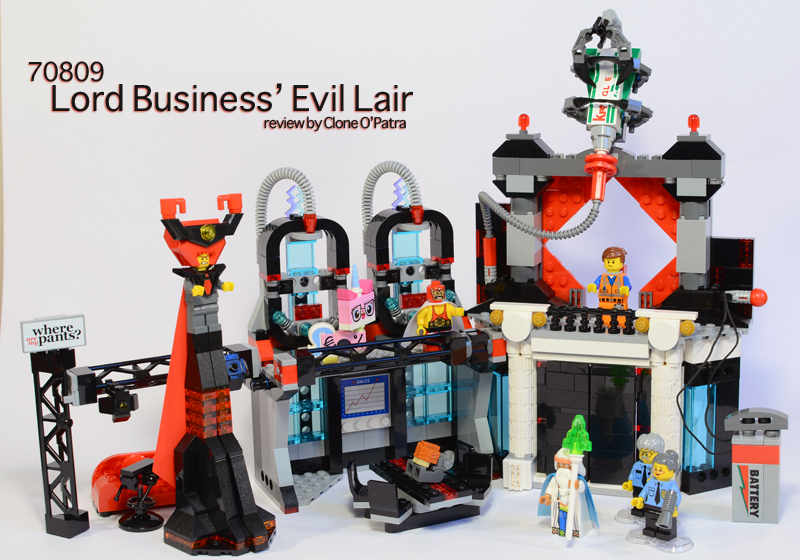 Thanks for the review Clone O' Patra! Nice! Really looks like an evil villain lair! I could certainly place other villains from DC superheroes in here and have an excellent lair which is the one thing TLG don't seem to want to give us. these sets are all really unique and interesting and having Morgan freeman in a set is always a good thing! Wow, the pants are one big piece? That's quite hilarious indeed! The reviewing fiesta has started! Thank you Clonie for starting it with this set. At first, I thought someone had added the marks on the Uni-Kitty by himself, but then I saw the box art and that it's called the "Biznis Kitty" here. 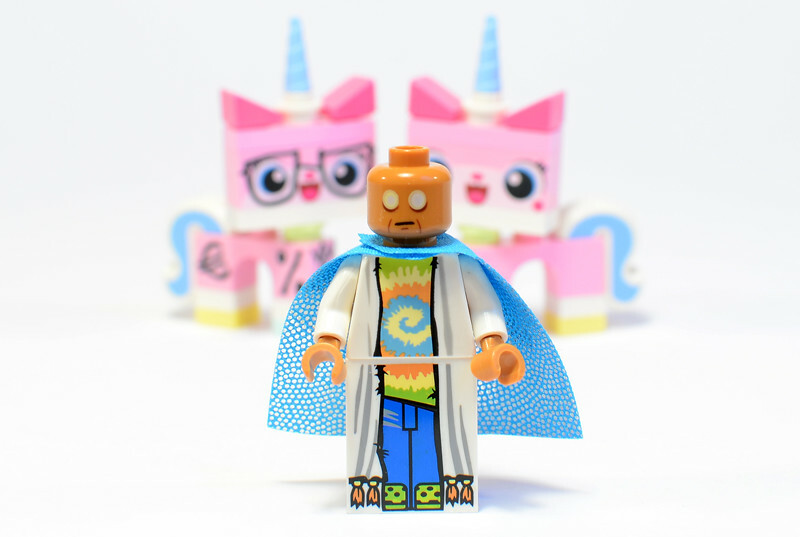 Other than the minifig type parts (including the tail on Biznis Kitty, the legs and headgear on Lord Business etc) are there any new molds in this set? 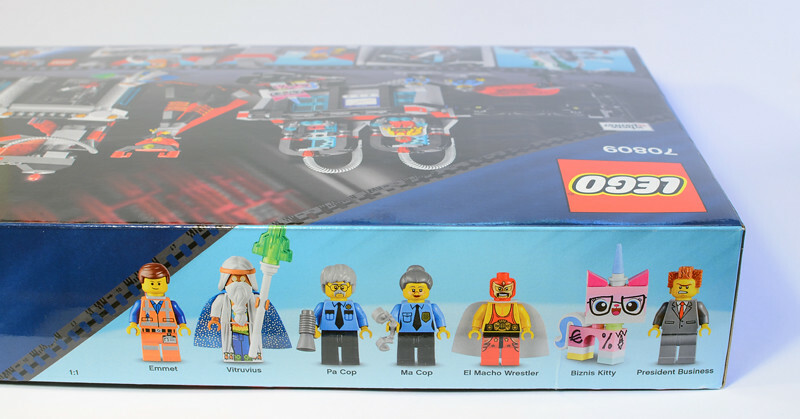 Now that I have seen the review, I am less interested in this set and will probably just add the interesting parts (Biznis Kitty, Ma & Pa Cop, the clear "glue" pieces) to my BL wanted list and buy them eventually. Thanks for your nice review of my set. This isn't apparent from the review, but my understanding is that Ma and Pa Cop are Emmett's parents. 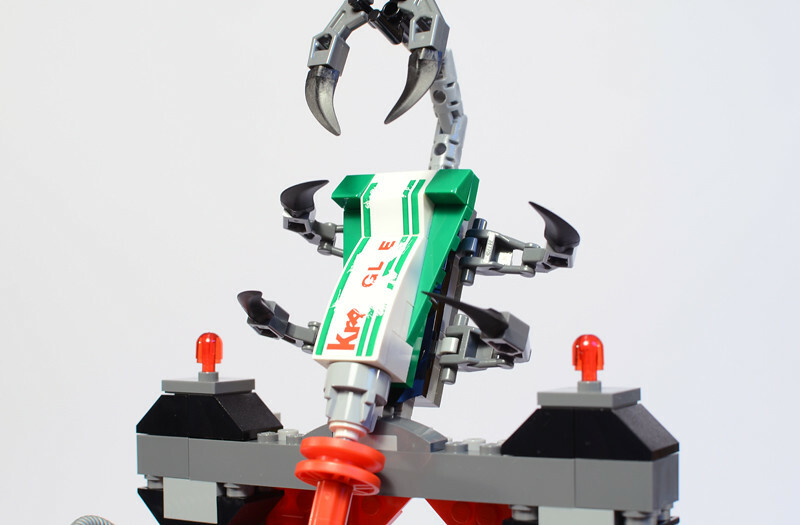 Also, raise your hands--who used Krazy Glue on a Lego creation when you were a kid? Seeing that brick-built bottle is hilarious! I did not notice many new 2014 pieces in this set. There is one 2x2 round tile with hole, but it's not much. 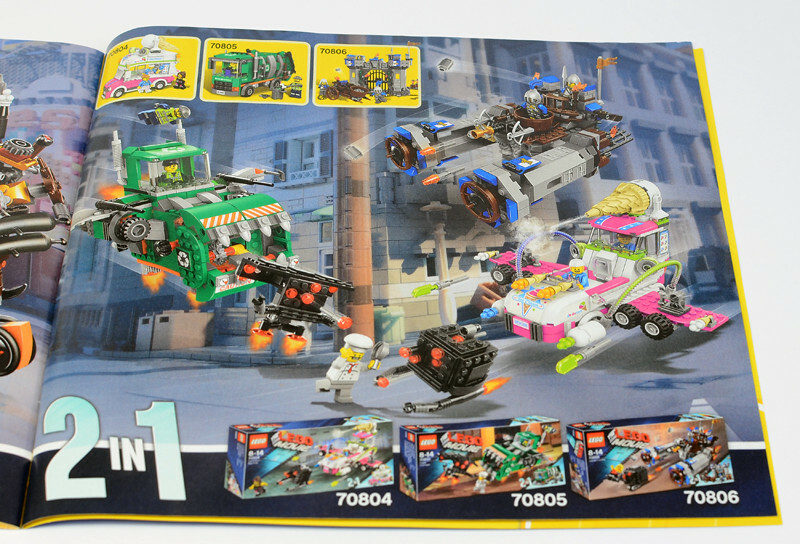 You're definitely correct that a lot of the other sets in the line contain a lot more of the new pieces that are rolling out. This is true. I guess I was just looking forward to spinning them in their seats! It's a great table anyway. Another job well done. I thought they were actually Bad Cop/Good Cop's parents. I meant to snap a family photo to that effect… The movie will tell us for sure! Thanks for the review! This is a weird-looking set, for sure, but I do like the settee and the tube of glue, both of which you pointed out. 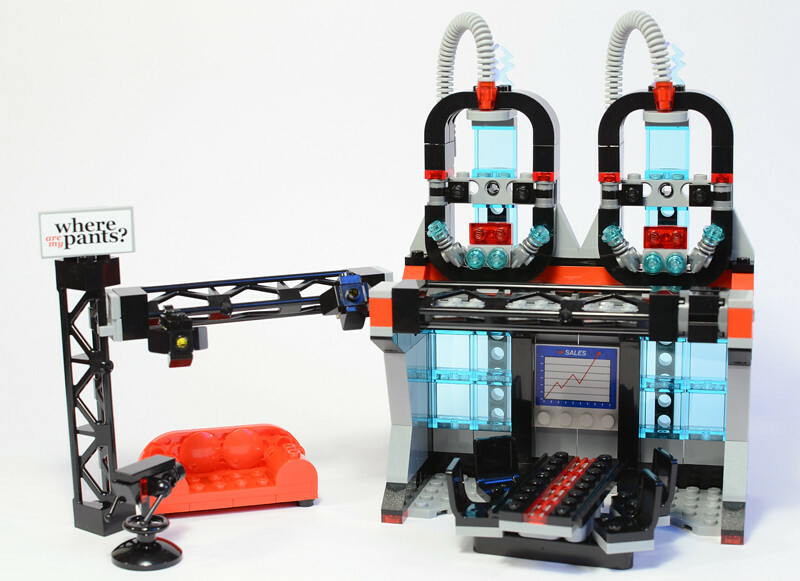 The set seems somehow absurd, but I'm sure it'll make sense when The LEGO Movie comes out. HEHE! It last, reviews! I look forward to the rest! Well done! Excitement! A good review but it is hard to put this set as well as some of the others into context of what exactly bits are for and what part they play in the movie until we have actually seen the movie. The same with some of the mini-figures, like the elderly cops here. Also I am not sure of the connection between the two kities, are they the same one, but evil'ified or what? I think there is still a lot we need to know about the story before we can post judgment on some of these sets and how they relate to each other? Nice and informative review! 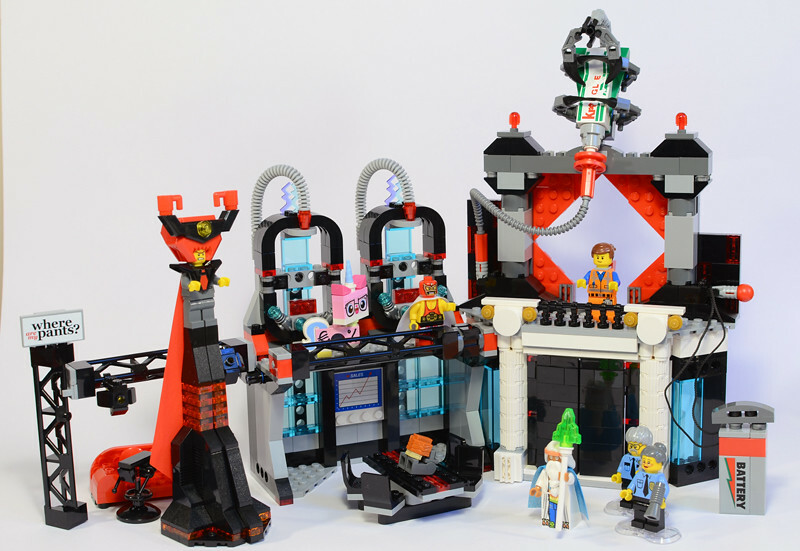 I like the way you focused on Vitruvius and the rest of the figures in this set. I'm quite fond of them and they might even persuade me into buying this set someday. The only thing missing from your review, however, is a picture/scan of the parts inventory in the back of one of the instruction booklets. I'm quite obsessed with any brand-new parts that might be released, so I would appreciate you maybe sending me a scan/picture of the parts inventory. 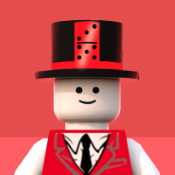 I'm also interested in a picture of Lord Business' hat without the red cups and trans-yellow stud, as I'm curious in knowing whether his hat is one piece or multiple pieces. Thanks in advance. Thanks Clonie, not too fussed on this set, but knowing me, I'll pick it up . Great Review! Thanks for the review! This set is awesome! Great review. I'll definitely pick this one up. El Macho returns! Great review! 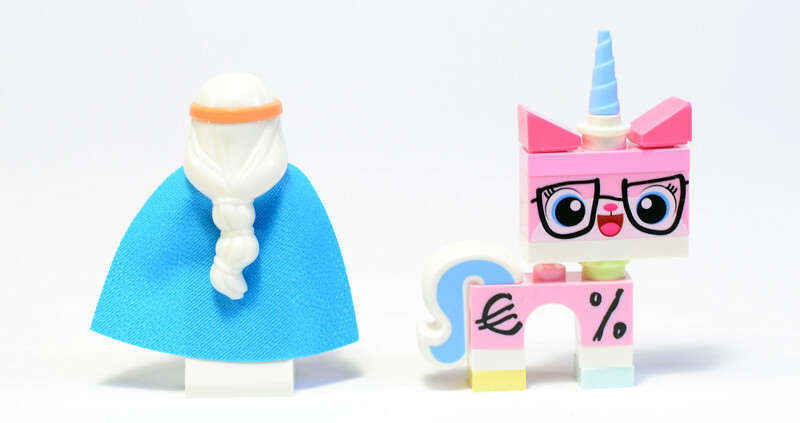 Two questions: Are Vitruvius' beard and hair one piece, or two? Can you show a back shot of Pres' armor piece? Thanks for another awesome review! Since the instructions can generally be found on LEGO.com, I don't usually take pictures of the parts layout. 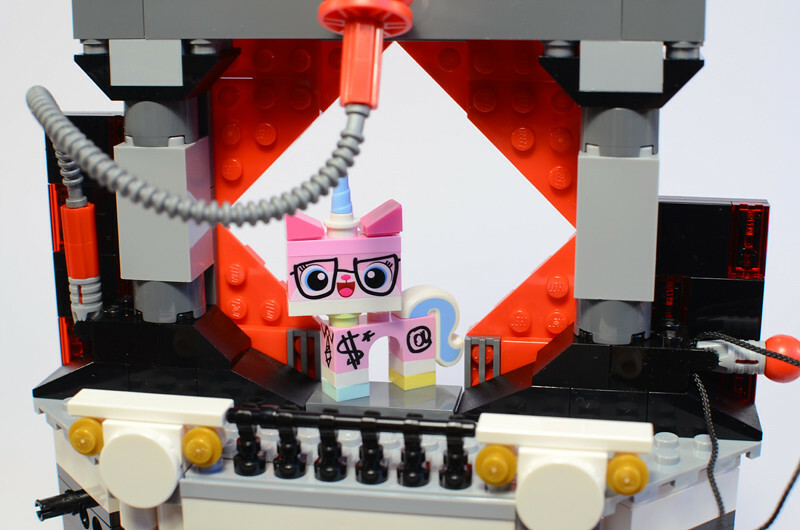 The LEGO pdf will be more legible anyway. I did just check… and they aren't there yet.. But it seems like the only newer parts are the black A-frame piece, a single 2x2 round tile with hole, a 1x2 plate with clip in the middle, and a 2x2 piece that's raised on one side to be a SNOT piece. Not a lot, in other words. The beard and hair are two excellent pieces. Here's another shot of the President. That's how far down the back of his armor goes (not far). To sort of answer TAFOL's question, the helmet is one piece besides for the cups and yellow stud.